After the browser is up on your Samsung Galaxy S 5, it’s designed to function like the browser on your PC. At any time, you can enter a web address (URL) by tapping the text box at the top of the screen. You can try this by typing in the address of your favorite website and seeing what happens. 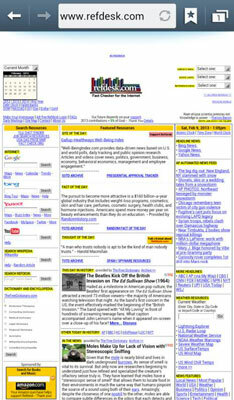 For example, the page seen in the example is the regular version of the website Refdesk. As you can see, the website is all there. Also as you can see, the text is very small. This particular website is designed to take you to a lot of useful links throughout the Internet. So this is an extreme example of a regular website. You can stretch and pinch to find the information you need. With a little bit of practice you can navigate your familiar websites with ease. The other option is to find the mobile website. In the case of Refdesk, you can get to the mobile version of this site by entering m.refdesk.com into the text block at the top from the software keyboard. As a comparison, here is the mobile version. It has fewer pictures, the text is larger, and the mobile version loads faster — but it’s less flashy. 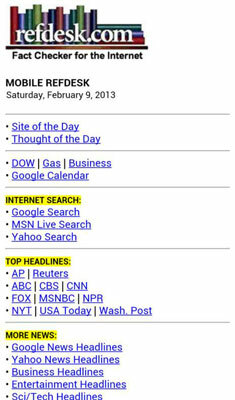 Refdesk.com is far from the only website to offer a mobile version. Many sites —from Facebook to Flickr, Gmail to Wikipedia — offer mobile versions. So how do you get to the mobile websites? If a website has a mobile version, your phone browser will usually bring it up. Samsung has gone out of its way to work to make the web experience on the Galaxy S 5 phone as familiar as possible to what you experience on your PC. The most common difference between the address of a mobilized website and a regular one is that the mobile site uses /mobile.com at the end of the address. For example, the mobile version of Amazon.com is www.amazon.com/mobile. If your phone doesn’t automatically bring up the mobile version of a site, the simplest way to find it is to Google the desired site along with the term mobile. For example, the first option you get from Googling Flickr mobile on your phone is the mobilized website for Flickr.